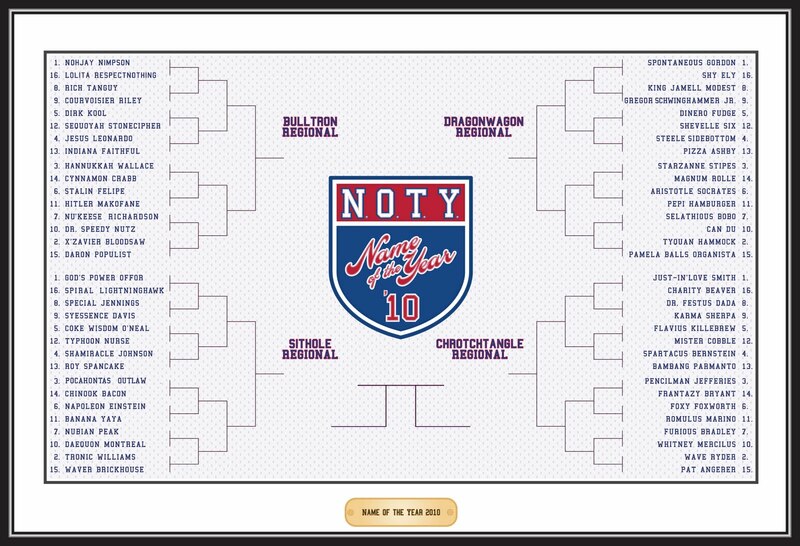 For a PDF version of this year's bracket, click here. 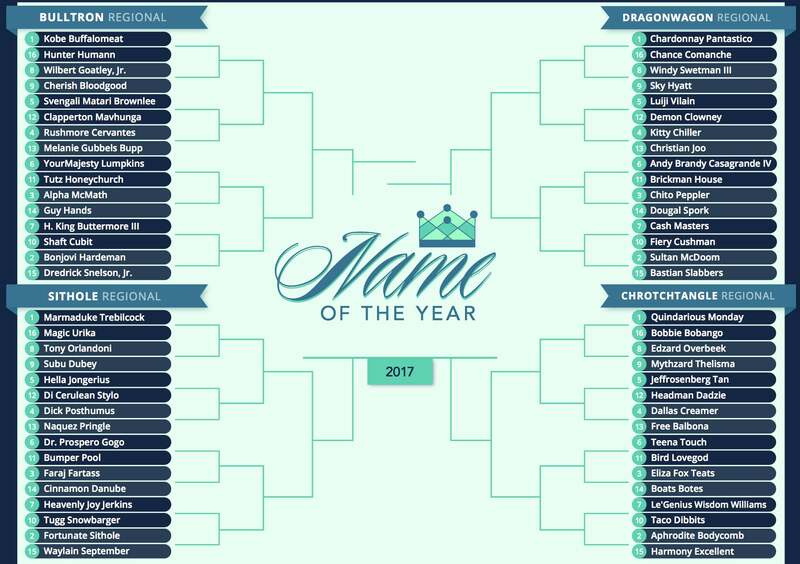 These are exciting times for Name of the Year. Since we spoke to you last, several of our past winners have found themselves back in the headlines. Steele Sidebottom, the People’s Choice in the 2010 contest, recently inked a five-year contract extension with the Australian Football League’s Collingwood Magpies. Hector “Macho” Camacho, the first ever NOTY winner (and, let’s be honest, a minnow compared to today’s contenders), earned a posthumous induction into the Boxing Hall of Fame. Most significantly, 2001 champ Tokyo Sexwale tossed in his legendary name for FIFA’s presidential race, though he later withdrew it. “It’s your problem now,” he said of soccer’s famously corrupt governing body. Sexwale’s waves in the FIFA race prompted many readers to send in his name as a potential 2016 naminee, but as many of you know, he is ineligible; once a name has been considered for our tournament, it can never be included in a future bracket. This is a crucial rule that promotes a diverse and fresh selection, but it’s also a tragedy. 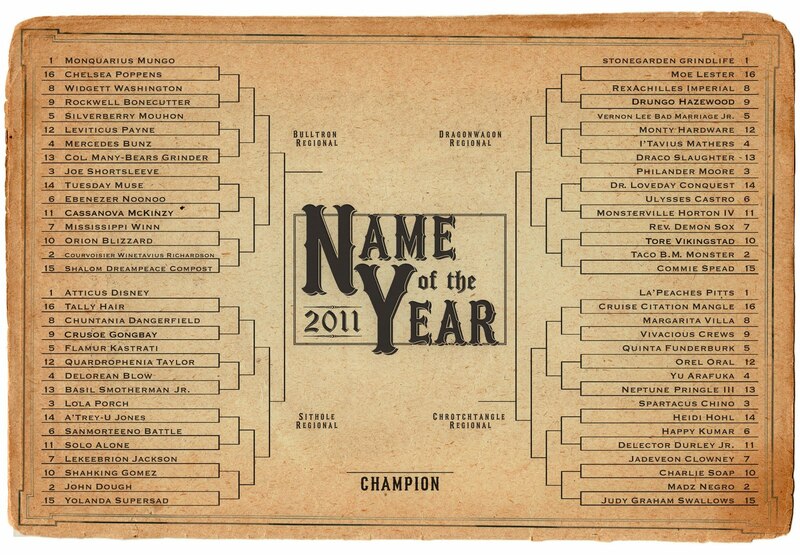 Every celebration of a Name of the Year champion requires 63 eulogies for those who didn’t quite complete the journey, and unlike Mr. Sidebottom, Mr. Camacho, and Mr. Sexwale, the majority of those bygone naminees are unlikely to make splashy headlines in the future. 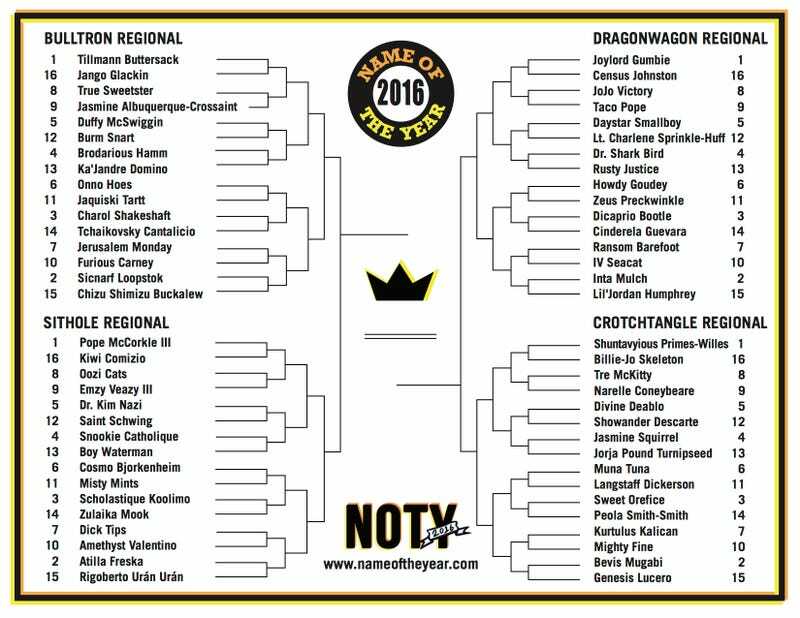 For the 64 people who have made our 2016 field, a share of glory is up for grabs. Some of them, such as four-star college football recruit and Bulltron Regional four-seed Brodarious Hamm, are likely to garner more attention in the future. Others, such as mid-80s competitive bowler and Dragonwagon Regional two-seed Inta Mulch, may never show up in newsprint ever again. When weighing names like Mr. Hamm’s or Ms. Mulch’s against those of their opponents, however, past, present, and future accomplishments play only a small role, if any. What matters more is the look of each name’s particular arrangement; its sound (we suggest our readers say all these names out loud before passing judgement); its rhythm, cadence, and meter; the power of the whole created by its two (or more) parts; and a host of other technical factors that can improve the quality of a name without the merits of the individual attached to it ever coming into play. This is my absolute favorite quality of our yearly endeavor. The people in our field hail from all walks of life, united by the spectacular names to which they have been legally bound. No matter their stories, no matter the direction in which their lives will later head, they are all welcome here. Voting will commence shortly. Will your intentions be True Sweetster? Will your vote be cast with Rusty Justice in mind? 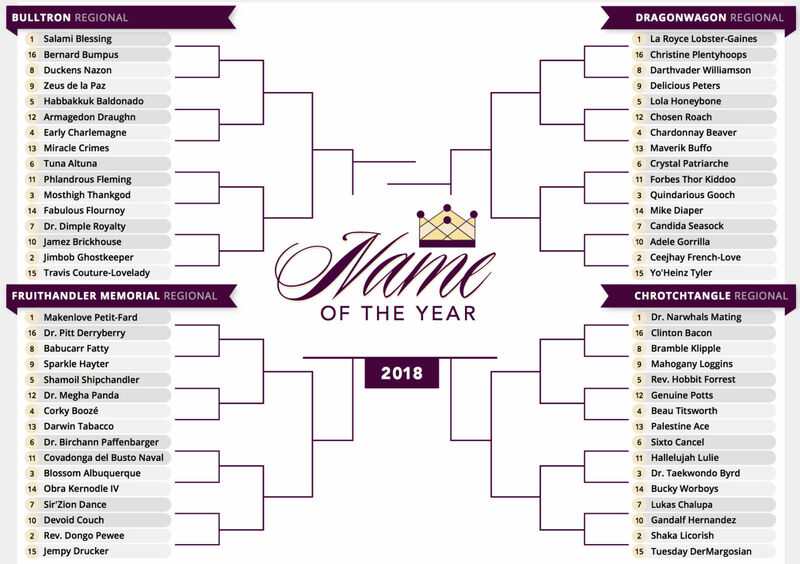 Will your favorite name achieve JoJo Victory? Or will you find yourself playing Jerusalem Monday morning quarterback? It’s going to be a fun year. Hit us up on Twitter if you’d like to follow along.